Want to know more about the behind the scenes work that goes on at BART? Well keep reading to learn more about our work in the Bristol Avon Catchment Partnership and how this shapes our projects! The Bristol Avon Catchment Partnership is part of a national network of partnerships attempting to show that working together will deliver more for our watery environment than working in isolation. Working in partnership is hard. It is rarely the case that everyone has the same priorities and partners are certainly not all “equal”. Some are huge and are driven by regulation – others are tiny such as BART and are driven by passion. Sadly many important partners simply cannot find the time to get involved. The partnership has no legal authority and operates within existing regulations, we simply believe that we can achieve more together, and BART certainly feel that by taking part we are going in the right direction. Current priorities are to turn the very laudable aims to improve our rivers contained within the Bristol Avon Catchment Plan into real action. This is extremely hard work, not least because it is pointless creating a plan that will not be supported or financed, and in an economy seemingly inexorably driven by a “jobs and growth” agenda all partners already have stretching business as usual objectives which often vie against each other for funds. 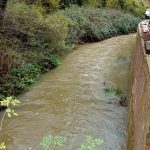 The partnership strives to overcome this by identifying how these business objectives can become pillars around which multiple benefit projects can be built – hopefully attracting new investment towards improvement for our rivers and the watery environment. You will have seen the headlines about local cities and towns being stretched to the limit with budget cuts, this is also true of the agencies tasked with looking after our environment. The net result is that rivers and the riverside environment is often at the end of a long queue when seeking funds to protect these fragile and degrading environments. If you are wondering how you can help please read on! There is a huge amount of change taking place within our catchments caused by the “jobs and growth” agenda and the need for house building. These changes will affect all of us and of course our rivers and streams, and BART believe it is vital that the public play a part in shaping what happens to our rivers whenever there is an opportunity. It is by commenting on local plans and the many consultations currently taking place (e.g. as currently in Wiltshire and South Gloucestershire) that public views can help shape these changes and protect our rivers. Getting involved can help inform decision makers that you value your local river environment. Please take the time to do this if you possibly can. In case you do wish to comment on local plans – whenever you see the word environment it pays to clarify that it is the river you want protected and improved. In too many cases our river environments are negatively affected and mitigation is made in an indirect way. The rivers we have in our catchment cannot be replaced by offsetting elsewhere – they are the only ones we have. We support any environmental improvement but not at the expense of our rivers! If you read this before Christmas have a good one – otherwise enjoy your New Year! 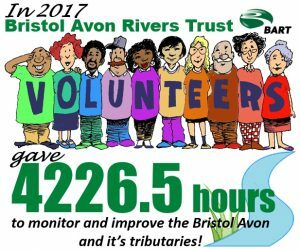 In 2017 our wonderful volunteers contributed 4226.5 hours to BART to help restore and protect our rivers! We would like to say a huge thank you to every single one of our volunteers, we couldn’t achieve half as much without your support. 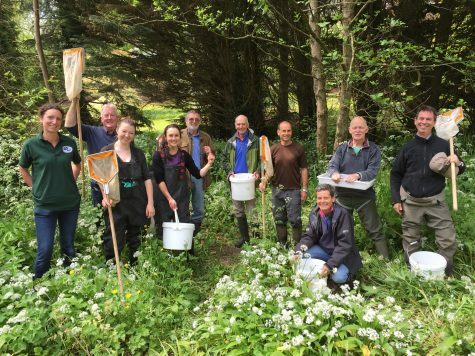 In total 826 people from across the Bristol Avon catchment got involved with our projects ranging from research, practical river habitat improvements and education. If you would like to volunteer with us in the future please keep an eye on our website volunteering page, where you’ll find a summary of opportunities and our events calendar (www.bristolavonriverstrust.org/who-we-are/rivers_trust_supporters/). On this page you’ll also find information on volunteering as a BART Beacon, where you can sign up to be the eyes and ears on a section of river local to you. We are building a network of beacons across our catchment so that we can keep an eye on as many rivers as possible! Once again a huge thank you and well done to everyone who volunteered with us this year, we look forward to seeing you again in 2018! Walkover surveys find room for improvement! BART have been very busy recently, travelling all over the catchment doing walkover surveys and writing advisory reports for river improvement projects including the Corston, Newton, and Nunney Brooks and the River Somer. 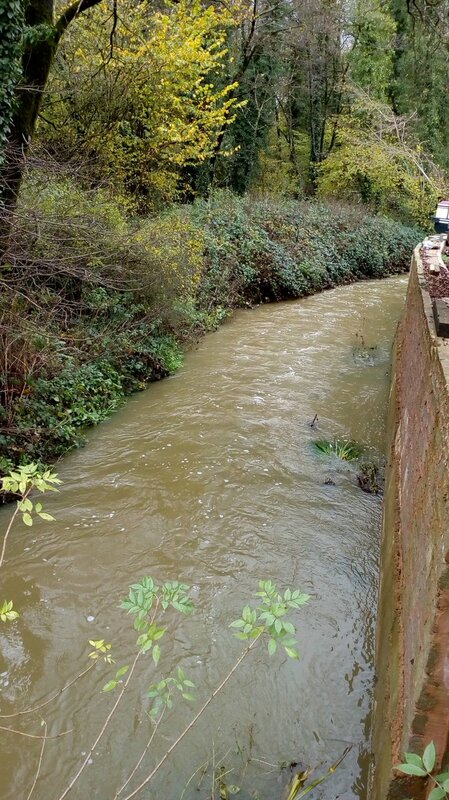 Jess, our Aquatic Scientist, has found many issues on the Nunney Brook including channel straightening and re-enforced banks which means there is limited bankside and in-stream habitat. She also found sections of the brook were overly deepened, sluggish, full of sediment and heavily shaded, preventing light from reaching the channel. These factors will reduce water quality and productivity in the channel, suppressing invertebrate populations due to lack of habitat and food sources which in turn reduces populations of other river wildlife. More survey work took us to a section of the River Avon near Sherston, Wiltshire, where we spent a beautiful evening assessing numbers of spawning Brown trout. We marked the locations of ‘redds’, which are depressions dug by the Brown trout into which they lay their eggs. This survey followed concerns of reduced numbers of the fish each year along with lower water levels. We are planning to put in some woody debris structures here next year to increase the diversity in water depth and flow, which will also help to scour the riverbed gravels of sediment which can smother the fish eggs and reduce spawning success. To best position the woody debris structures to give the greatest benefit we are going to be monitoring locations of the redds over the winter. A beautiful evening for survey work! 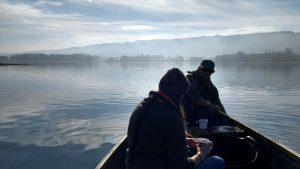 Back in October we worked with West Country Rivers Trust and Bristol Water to begin an eel escarpment study on Blagdon Lake reservoir in Somerset. It was a week of stunning autumnal mornings, so it was a treat to get out on the lake with beautiful views across the misty waters. The first part of this study investigated the population of the critically endangered European Eel in Blagdon Lake reservoir to see how many eels enter and leave it as they migrate upstream from the sea. This is a crucial part of their life cycle as the eels migrate from where they are born in the Sargasso Sea, across the Atlantic Ocean to the west coast of Europe. From here they travel into estuaries and upstream into rivers where they can spend between 5-20 years feeding and maturing until they are ready to migrate back downstream to the Sargasso Sea to spawn. Barriers to migration are one of the main challenges that eels face, which is why this study is so important as it will show whether the eels are able to survive in the lake and eventually exit it as they migrate back downstream. 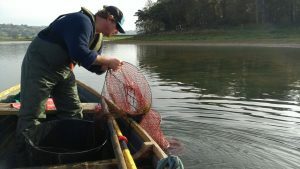 We used Fyke nets to fish for the eels overnight, which trap the eels as they swim into them. The nets do not harm the eels in any way, but simply prevent them from escaping until we come in the morning to count and measure them. Measuring the size of the eels will help us to age them, which is important to know as it tells us the stage of their life cycle. This project will help us to find the best ways to help this endangered species, so watch this space for more eel related research!